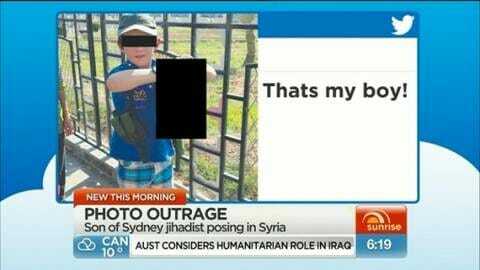 The son of a Sydney jihadist poses for a photo with a decapitated head in the caliphate. The picture, taken in the northern Syrian city of Raqa, was posted on the Twitter account of Khaled Sharrouf, an Australian who fled to Syria last year. Children are being photographed playing with severed heads in the ISIS caliphate. Parading severed heads in front of pals like a new toy, this is the life of children growing up in the Islamic State. Sickening images have emerged of boys no more than 10-year-old revelling in the bloodbath which has engulfed the region. Another picture shows a youngster holding a Kalashnikov and posing beside the body of a crucified rebel soldier. The horrific scenes emerged after pictures of a baby surrounded by guns and grenades was posted online yesterday by ISIS. Muslim leaders will use sermons today to reiterate their opposition to extremism, urge young people not to join fundamentalist fighters, and call for the release of all hostages held by the Islamic State.